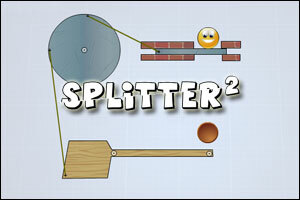 Splitter 2 is the sequel to Splitter, a physics-based puzzle game created last November by Eugene Karataev. The goal of the game remains unchanged: help the little smiley reach the brown exit in a limited number of cuts. To do so, use your mouse to split objects and joints and let gravity do its thing. You can split joints and wood objects, but not metal and brick objects. Splitter 2 features 32 new levels of increasing difficulty, plus a level editor to build your own levels and share them with the community. I’m looking forward to playing “Splitter 2 Pack 1” a la Bloons: the concept of the game is simple and brilliant, and with the help of the fans, I have no doubt that a Pack series would be very successful! Splitter 2 video walkthrough (original levels)! with 21 brand new levels! very interesting…some the first try, and others…well I am stuck and taking a break.Well done game and like it alot. Look forward to your walkthrough, Prid…thanks! Glad to see that a sequel to this was finally made, but a bit sad in both the lack of stars and the overall difficulty of the levels. Only 2-3 levels were really hard. Thank you Prid and Tasselfoot for the Video Walkthrough. But It’s Fun At Least! That is SO true, Toxic! I can’t get it to load…. Nope…. Same thing… it says..
Hey This game says this message while loading: Invalid/missing session data, did you run load? Help??? ?